My grandmothers mother's name was something like "Mushke" (from what my father remembers from his mother). I am trying to determine the correct spelling (e.g. for looking up a birth certificate), or any other reasonable spellings / misspellings for this name. In a recent document I got for my grandmother her mother's name is written (second word in the second row) as either "Możke" or "Mojke" - i tend to believe the first one is the correct one but would like any information or opinions. I don't know the meaning of the name either but its a female Jewish name from Poland. Due to repeated requests, here is the full document. The first word is indeed Josel (יוסל) which is my grand mothers father's name. The middle word is NOT Mojsze (משה) its a female name, either "Możke" or "Mojke" or something similar. Also the first letter of the last name is K not R - i.e. its Kopelewicz which we know to be my grandmother mother's maiden surname. Still looking for some way to confirm the existence of such a name or ideas of where could it came from. Ideas for the meaning of the 8th item on the document would also be appreciated. UPDATE 2: @Lennart Regebro suggested to compare the ending of my grandmothers mother's name with the word Zabrze. here are zoomed images, IMHO it proves (hopefully once and for all) that "mojsze" is not an option. Specifically IMHO it can be seen on the top right of the letter I take to be a "k" that there are two strokes there. IMHO again the way this person writes his K's is by first going "with the flow" starting from the top left down and to the left then partly up (to around the middle of the letter and then going again down to the right leg of the letter and to the next letters adding top right hand of the "K" as part of a second stroke. IHMO this can also be clearly seen in the "K" for "Kopelowicz". All of this leeds me to belive the text says "Mużke". I also accept the possibility that it is nickname for some other name and would love to hear ideas. 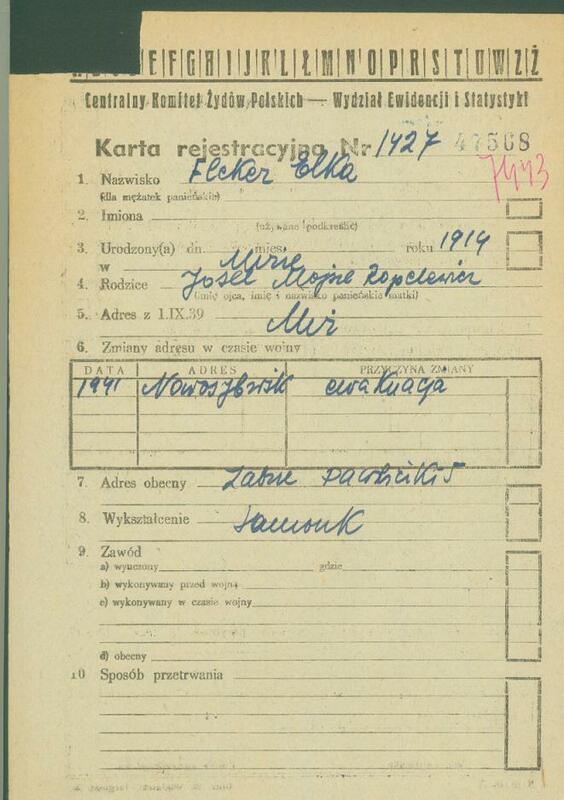 The document is a registration card issued by Central Committee of Polish Jews - Division of Records and Statistics. "Mojsze" was a common male Jewish name in Poland. The field here is labeled "father's name, mother's name and maiden surname", but it seems to me as if someone has mis-filed this form, as the full text reads "Josel (Josef?) Mojsze Ropelewicz" which is definitely a male name. Could you perhaps show the full scan of the document? Not the answer you're looking for? Browse other questions tagged naming-convention poland or ask your own question. What is needed in a Name?